Fictionalizing your life, or how autobiographical is your fiction? SCN novelist and lifewriter Judy Alter looks back on a book she wrote three decades ago, and finds in it pieces of her autobiography. I’ve been proofing Mattie, the first adult novel I ever wrote and winner of the 1988 Western Writers of America Spur Award for best traditional novel. It’s been available on Kindle forever and done well at 99 centers–#64 today in Kindle ebooks, Genre Fiction, Medical. I’m going to post it to other platforms and thought after almost thirty years it deserved another proofing. 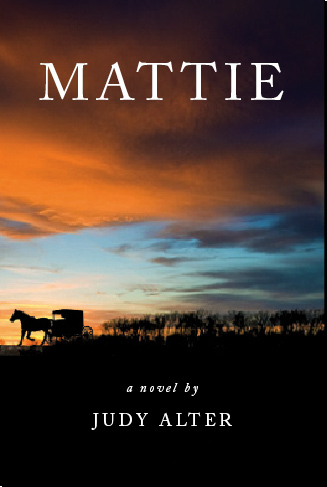 Mattie’s story is loosely based on the life of Georgia Arbuckle Fix, a pioneer woman physician in western Nebraska at the turn of the twentieth century. I didn’t know at the time that Mari Sandoz had also fictionalized Fix’s life in Miss Morissa, and the comparison by loyal Sandoz devotees was not kind to me. It’s intimidating to re-read something I wrote all those years back. My style is different—the 167-page book is all long chapters and lots of space breaks, and did I really begin every other sentence with “So”? I’m correcting only egregious errors; why mess with success? At the time I wrote, I was raising teen-age daughters, with all the angst that involves. The angst is reflected in Mattie’s rebellious daughter, Nora. Only Nora never reaches the wonderful reconciliation my girls did—they are now best friends with each other and with me. When I wrote, we hadn’t reached that reconciliation either, and the angst was much too familiar. Late in the book, Mattie takes into her home and bed a drifter named Eli, skilled carpenter, a good man, but not one to settle down. I took a week off from work to write the last chapter. The words came in a rush as though someone was channeling me who knew the story. Eli simply rides off after a while, moving on as is his nature, leaving Mattie devastated again—and puzzled. At the time, I was seeing a man I liked well enough to envision a future with him—he liked my kids and wasn’t scared of them, rare in suitors. He was gentle, kind and fun. But as I wrote those last pages, I had a flash of clarity: he too would be moving on. He was no longer going to be a part of my life story. We were together that night—celebrating our joint birthdays, I recall—and I was sad. But I couldn’t tell him why. Scary thought, especially for mystery writers, if your writing not only reflects your past but predicts your future. Happy Cinco de Mayo, everyone. Judy is the author of two mystery series—Kelly O’Connell Mysteries and Blue Plate Café mysteries—plus the stand-alone, The Perfect Coed. In a long career, she has written fiction and nonfiction for adults and young adults, primarily about women in the American West, and garnered several awards. Judy retired as director of TCU Press, a position she held for 23 years. She is a member of SCN; a member of Sisters in Crime and the SinC subgroup, the Guppies; and a member of the Texas Institute of Letters and the Texas Literary Hall of fame. She edits her neighborhood newspaper and welcomes her fifth-grade grandson every school day. A single mother of four and grandmother of seven, she lives in Fort Worth with her lively Bordoodle puppy, Sophie. Visit her blog and her website. This entry was posted in Uncategorized and tagged Judy Alter. Bookmark the permalink.